Three years ago, Researchers from Aarhus University in Denmark discovered the presence of electric currents in the seabed. They suspect at the time bacteria joined together in a network is responsible for this phenomenon. After three years, they have discovered proof to their theory: the actual bacteria. The image shows cable bacteria in the mud of the sea bottom. While studying the phenomenon, the researchers noted that drawing a horizontal wire through the seabed cut off the current flow, similar to cutting power cables in real life. They also noted the presence of the bacteria whenever they studied the ocean floor. The whole thing came together when they studied and observed the bacteria and noticed wire-like strings enclosed by a membrane. 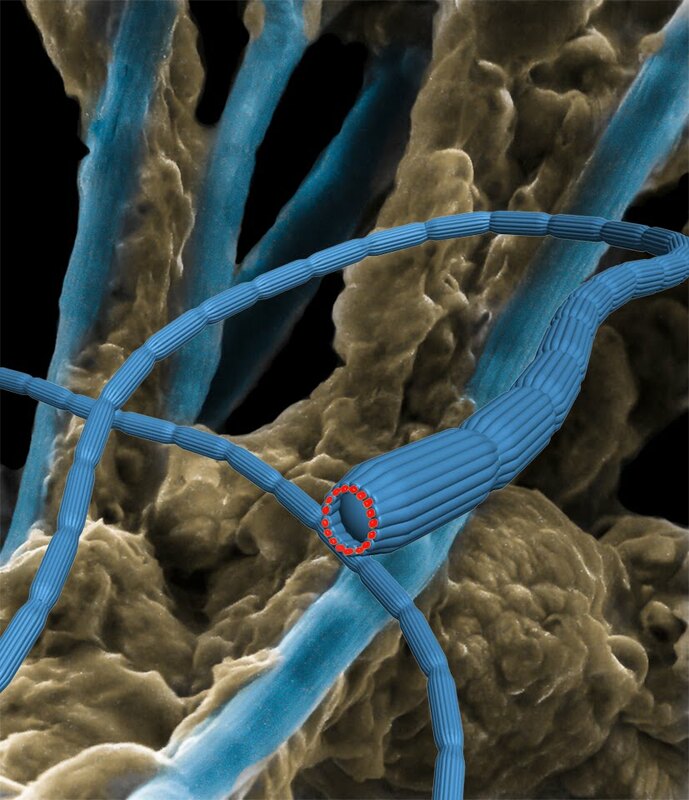 “Such unique insulated biological wires seem simple but with incredible complexity at nanoscale,” says PhD student Jie Song, Aarhus University, who used nanotools to map the electrical properties of the cable bacteria. The cable bacteria are about a centimeter long and are hundred times thinner than a strand of human hair. The whole bacterium acts as electric cables transferring electricity through its insulated wires. A teaspoon of mud from the seabed can contain as much as one kilometer worth of electric cables. With thousands of kilometers of electric cables in a single square meter of seabed, the electric current the bactera generates gives cable bacteria such large benefits that it conquers much of the energy from decomposition processes in the seabed. The generated electric current is used to release the energy from its food. The cable bacteria can maintain an efficient combustion down in the oxygen-free part of the seabed. It just needs one end of the individual bacterium to reach the oxygen which the seawater provides to the top millimeters of the seabed. The combustion is a transfer of the electrons of the food to oxygen which the bacterial inner wires manage over centimeter-long distances. However, small disturbances (just like their horizontal wire experiment) can lead to fatal "cable breakage" in the fragile bacteria. "On the one hand, it is still very unreal and fantastic. On the other hand, it is also very tangible," says Professor at Aarhus University, Lars Peter Nielsen, who is in charge of exploring the natural electrical currents. This opens up a whole new understanding of bioelectronics at the molecular level and the role of these bacteria in the history of the Earth. It also promises new technological advances in bio-nanotechnology and electronics which can be applied in any field especially in the medical and industrial sectors. Together with their partners from the University of Southern California, USA, the researchers published their study in the journal, Nature.